The Superman Fan Podcast: Episode #192: Superman Comic Books Cover Dated July 1959: Superman #130 & Action Comics #254! Episode #192: Superman Comic Books Cover Dated July 1959: Superman #130 & Action Comics #254! Superman 130 & Action Comics 254, July 1959! - THE CURSE OF KRYPTONITE (7 pgs. ), written by Otto Binder and drawn by Al Plastino. - THE SUPER SERVANT OF CRIME (7 pgs. ), written by Robert Bernstein, pencilled by Curt Swan and inked by George Papp. - THE TOWN THAT HATED SUPERMAN (7 pgs. ), featured on the cover, was written by Otto Binder, pencilled by Wayne Boring and inked by Stan Kaye. ACTION COMICS #254, July 1959, was published around May 28, 1959. It contained 32 pages for the cover price of 10¢. Mort Weisinger was the editor, and the cover was pencilled by Curt Swan and inked by Stan Kaye. - THE BATTLE WITH BIZARRO (12 pgs. ), written by Otto Binder and drawn by Al Plastino. This story was reprinted in SUPERMAN IN THE FIFTIES, SUPERMAN: THE MAN OF TOMORROW ARCHIVES vol. II and SHOWCASE PRESENTS: SUPERMAN vol. I. - CONGORILLA GOES WILD (6 pgs. ), drawn by Howard Sherman, starred Congo Bill in his sixth appearance as Congorilla. - SUPERGIRL'S FOSTER PARENTS (8 pgs. ), written by Otto Binder and drawn by Jim Mooney. This story was reprinted in SUPERGIRL ARCHIVES vol. I and SHOWCASE PRESENTS: SUPERGIRL vol. I. Elsewhere in DC Comics, 27 titles carried the July or July/August 1959 cover date. On August 29, check out the first episode of SUPERGIRL'S COSMIC ADVENTURES podcast, hosted by Daniel Reed, at http://supergirlpodcast.blogspot.com/, and follow the podcast on twitter @SGirlPodcast. The website address I posted last week was to a different Supergirl website. If you're interested in the upcoming DC relaunch in September, here is a blog post about the November 2011 Superman solicits: http://slaymonstrobot.blogspot.com/2011/08/new-52-doesnt-mean-original-52.html?utm_source=feedburner&utm_medium=feed&utm_campaign=Feed:+SlayMonstrobotOfTheDeep+(Slay,+Monstrobot+of+the+Deep!! 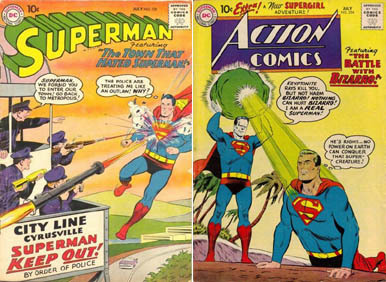 ), and some older Superman covers. For some great insight into DC comic book history, listen to Martin Pasko's interview on John Siuntres' podcast, WORD BALLOON at http://wordballoon.com. , posted on Tuesday, July 19, 2011. - Part II: The DCU Past Present And Future With Marty Pasko and Vaneta Rogers, originally posted on Thursday, August 4, 2011. - Part III: Robert Kirkman And Marty Pasko pt 3, originally posted on Saturday, August 13, 2011.